HMMH was contracted by the Central Florida Regional Planning Council to further interpret their 2013 noise study of the Avon Park Air Force Range with its associated Special Use Airspace (SUA) and MacDill Air Force Auxiliary Airfield, and assess the effect of its findings upon the 2010 Joint Land Use Study recommendations. 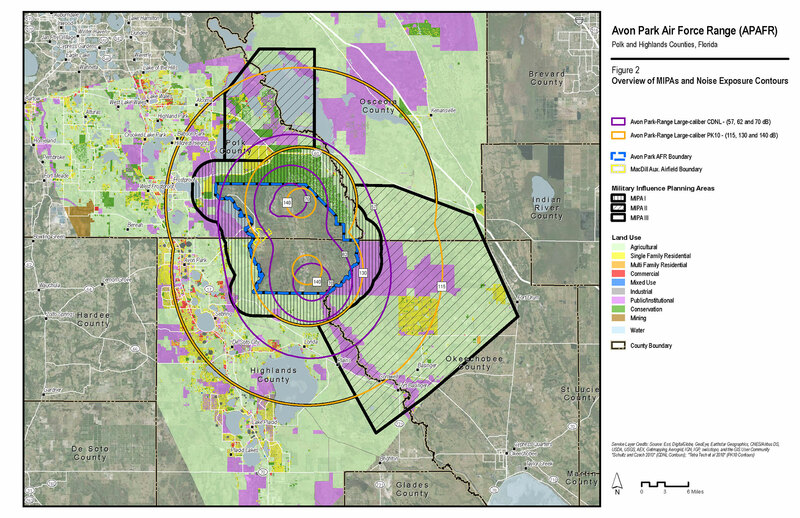 The Avon Park Air Force Range is a bombing and gunnery range encompassing over 100,000 acres of land, with its associated SUA including 1.5 million acres in five counties in central Florida. Noise sources include aircraft at MacDill Air Force Auxiliary Airfield, subsonic aircraft in the SUA, and large ordnance and small arms fire in the Range. In a standalone technical report, HMMH clarified and reviewed the relevant noise metrics, reviewed/analyzed land use and pertinent results of the 2013 study, conducted a literature review of existing relevant noise management regulations, laws and studies, and made recommendations for modifications to the Joint Land Use Study.